Should FDI in India’s thinktank sector worry us? It is a debate long overdue. This article by Prashant Reddy was published in the March issue of Open Magazine. In 1976, at the height of the Emergency imposed by Indira Gandhi, India’s Parliament enacted a piece of legislation called the Foreign Regulation Contribution Act. It prohibited political parties and ‘organisations of a political nature’, civil servants and judges, as also correspondents, columnists and editors/owners of registered newspapers and news broadcasting organisations— and even cartoonists—from receiving foreign contributions. The very fact that the Act makes a specific reference to cartoonists should be hint enough of the establishment’s paranoia vis-à-vis the ‘invisible hand’ of foreign powers back then. During a Rajya Sabha debate on the proposed bill on 9 March 1976, the term ‘CIA’ (Central Intelligence Agency) was mentioned at least 30 times by different legislators, while ‘Lockheed Martin’ (a military aerospace corporation) came up at least six times in the context of alleged instances of Americans pumping dollars into governments worldwide to buy influence during the Cold War. In 2010, a different parliament, with opposition members who had not been imprisoned like those in 1976, unanimously voted to update the law by passing the Foreign Contribution Regulation Act (FCRA). In fact, the Parliamentary Standing Committee that examined the bill was headed by the BJP’s Leader of Opposition in the Lok Sabha Sushma Swaraj, and it had no major objections. This time round, there was no talk of the CIA or Lockheed Martin. Instead, concern was focused on the increasingly influential role of Non-Governmental Organisations (NGOs) as institutions of civil society in India. The term ‘NGO’ found at least 40 mentions during the Rajya Sabha debate on the 2010 bill. The main concern of the Upper House appeared to be a lack of transparency among NGOs receiving foreign contributions. Hence the calls to strengthen the monitoring regime, although several MPs expressed worry that the new law would give the Centre too much discretionary power to crack down on dissenting NGOs. Worries about the 2010 Act’s overreach were validated last year when the Government used it to clamp down on NGOs involved in anti-corruption and anti-nuclear protests. As part of that exercise, at least four NGOs were booked under the FCRA for allegedly diverting foreign funds to aid the organisation of protests against the Koodankulam nuclear power plant in Tamil Nadu. Their bank accounts were frozen. The protests, however, did not end. Perhaps the most ironic use of the FCRA was when the Ministry of Home Affairs reportedly held back potential funding from the US-based Ford Foundation for the Mumbai-based Institute for Policy Research Studies (IPRS), a thinktank that runs Parliamentary Research Service (PRS). Incubated at the Centre for Policy Research (CPR), a Delhi-based thinktank, PRS was spun off and institutionalised as IPRS in 2010 as a Section 25 non-profit company with a registered office in Mumbai. The main aim of PRS was to provide non-partisan legislative research services to parliamentarians, most of whom are starved of resources to conduct independent research required to hold the Executive accountable in Parliament. The service’s popularity among MPs was obvious from the fact that several of them reportedly made individual representations to the Home Ministry against blocking foreign funds for its parent institute. The tragedy of why Parliament does not have a public-funded service like PRS is a debate for another day, but choking the IPRS of foreign funds raises a question of hypocrisy since the Central Government routinely collaborates with a wide range of civil society thinktanks that receive funds from the West. Let’s start with the Indian Council for Research on International Economic Relations (ICRIER). According to its filings with the MHA, accessible on the FCRA website (http://mha.nic.in/fcra.htm), ICRIER has received over Rs 11.5 crore in foreign donations from a range of international institutions such as the Asian Development Bank, World Bank, International Monetary Fund (IMF) and Sasakawa Peace Foundation between 2007 and 2012. This council, currently headed by Dr Isher Judge Ahluwalia, wife of Planning Commission Vice-chairperson Dr Montek Singh Ahluwalia, appears to have a cosy relationship with the present establishment. When the Government was in a fix over the contentious General Anti- Avoidance Rules (GAAR) of taxation, for example, it delegated the task of ironing out its problems to a four-member committee headed by Dr Parthasarathi Shome, a well-known economic policy expert at ICRIER. There are several other projects on which the Council’s faculty collaborates closely with the Government of India. That thinktanks are well networked goes without saying. In fact, ICRIER and PRS were involved in quite a controversy during last year’s Parliament vote on Foreign Direct Investment in India’s multi-brand retail sector. As reported by India Today, (‘Foreign Direct Instruction for our MPs?’ 6 December 2012), IPRS had organised a ‘close-door’ meeting at Delhi’s Constitution Club the day before the vote, where MPs were briefed on the benefits of FDI by Professor Arpita Mukherjee of ICRIER. Some MPs had publicly labelled this a ‘lobbying’ effort. Another example of close collaboration between the Centre and a thinktank that gets significant foreign funding is the one between the Government and the CPR, headed by Dr Pratap Bhanu Mehta. Between 2007 and 2012, according to its filings with the MHA, this thinktank received foreign funds of over Rs 40.8 crore from a range of donors such as the Ford Foundation, Google Foundation, International Development Research Centre, Economic and Social Research Council, Hewlett Foundation and IKEA Social Initiative. Environmental policy is another area in which foreign-funded thinktanks have a significant impact. The Centre for Science and Environment (CSE), headed by Sunita Narain with a governing board that has Ela Bhatt, BG Verghese, Dr MS Swaminathan and Dr NC Saxena among others, has received over Rs 67.7 crore in foreign funds between 2006 and 2012. The CSE’s main donors, according to FCRA records, include the Denmark- based Dan Church Aid, Germany-based Evangelischer Entwicklungsdienst EV, Heinrich Boll Foundation and the Swedish International Development Cooperation Agency. Other donors include the Commission of European Communities and Government of India. Going by the media coverage that CSE receives, it is safe to say that this thinktank has a profound influence on India’s environmental policy. An indication of its ties with the Government is the fact that the two had their own ‘side-event’ at the recently concluded Doha talks on climate change. The other green thinktank with generous foreign contributions that works closely with the Government is The Energy and Resources Institute (TERI). Consider this: the International Bioenergy Summit of 2012 held in New Delhi was organised by TERI and sponsored by the Department of Biotechnology (DBT). According to its FCRA filings, TERI, with a staff of over 900, has received about Rs 155.9 crore between 2006 and 2012 from a vast variety of donors. In the field of health policy, one of the most influential thinktanks is the Public Health Foundation of India (PHFI). Since it was founded in 2006, it has received a total of Rs 219 crore in funds, its biggest foreign donor being the Bill and Melinda Gates Foundation and biggest Indian donor being the Government of India. Other foreign donors, according to FCRA filings, include the National Institutes of Health (of the US government), Welcome Trust, International Development Research Centre and MacArthur Foundation. A public-private initiative, the PHFI is expected to shape India’s approach to public health policy over the next decade. An example of its influence on India’s health policy is the fact that its secretariat has been thanked and praised in a report of the High Level Expert Group constituted by the Planning Commission to frame a new policy on ‘universal health coverage’ for all Indians. On matters of internet policy, the Centre for Internet and Society (CIS), a Bangalore-based thinktank focused on internet governance and intellectual property issues, has been a member of some key government committees, like the one under Justice AP Shah to study privacy laws in India. The CIS also receives foreign funding. According to its website, it has received over Rs 8.3 crore in funds, a significant portion of it from foreign donors like the UK-based Kusuma Trust, which was founded by Anurag Dikshit, an Indian businessman who made a fortune selling his stake in a popular online gambling website. He eventually donated most of his wealth to the Kusuma Trust, which funds various charities across the world. In the human rights space, there is the famous Lawyers Collective, which, apart from its human rights advocacy, also provides legal aid to members of disadvantaged communities. Although this collective does not appear to work all that closely with the Government, it is interesting to note that it was founded by Indira Jaising, who is currently one of the Centre’s Additional Solicitor Generals. Since 2006, according to its FCRA filings, the organisation has received around Rs 21.8 crore in foreign funds from the Ford, Levi Strauss and Open Society foundations and from the Campaign for Tobacco Free Kids, Swedish International Development Cooperation Agency, among others. 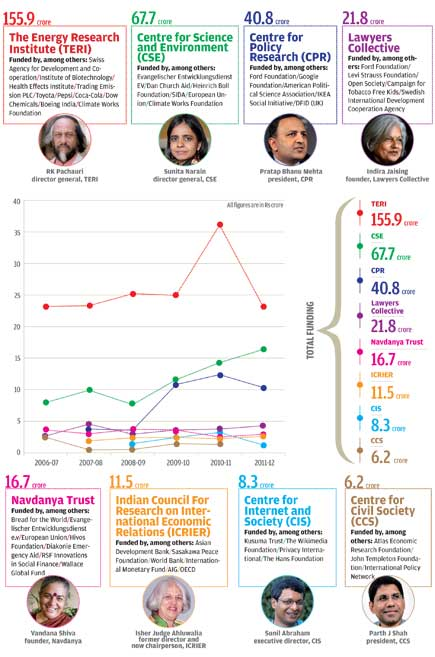 Another thinktank that deserves a mention is the Centre for Civil Society (CCS), which was founded by Dr Parth J Shah and has a ‘Board of Scholars’ with Isher Judge Ahluwalia, Jagdish Bhagwati, Lord Meghnad Desai and Swaminathan Anklesaria Aiyar, among others, as members. While it is not clear from its website whether it works closely with the Government, it was ranked 51st in a recent global survey of thinktanks by University of Pennsylvania. According to a CCS press release, these rankings were ‘based on not just our research and analysis, but also on our engagement with policy makers and ability to influence policy decisions’. The CCS’s rank was quite a surprise, given its modest resources. According to its FCRA filings, between 2006 and 2011, it received about Rs 6.2 crore from foreign donors such as the Atlas Economic Research Foundation, John Templeton Foundation and International Policy Network. As per its audited accounts, available on its website, donations from Indian donors were equally modest. The above examples demonstrate the influence of foreign funded thinktanks on almost every major aspect of Indian policy today, be it economic or environmental, related to public health or internet governance. Is this good or bad for India as a country? Given that most sectors of the economy are now open to foreign investment, does it make sense to regulate and restrict foreign funds for such thinktanks under laws like the FCRA? The answer depends on what Indian society expects of them. Do we expect them to be completely independent of donors in their views? Would an organisation like the CSE still get foreign funds from European donors if it were to readily welcome genetically modified (GM) food in India? In such circumstances, how independent should we expect these thinktanks to be in the arena of policy? Absolute objectivity—or at a least public perception of it—is an absolute myth. No matter who funds a thinktank, be it foreigners or Indians, it is impossible to be seen as such. The more pressing issue is of transparency. Are Indian policymakers aware of the details of foreign funds received by these thinktanks? Take, for example, a recent Parliamentary Standing Committee report that expressed serious reservations about GM food. The Committee repeatedly quotes with approval the deposition of Dr Vandana Shiva against GM food. A little-known fact about Dr Shiva is that her organisation, Navdanya, according to its FCRA filings, has received a total of Rs 16.7 crore between 2006 and 2012 in foreign donations from mainly European organisations (some of which also contribute to the CSE) like Bread for the World, Diakonie Emergency Aid, Hivos Foundation, Evangelischer Entwicklungsdienst EV, RSF Innovations in Social Finance, and even from the European Union itself. Would a Parliamentary Standing Committee headed by an MP of the CPM, a party that is always suspicious of the ‘foreign hand’, show the same deference to Dr Shiva’s views if its members knew of Navdanya’s European donors, several of which are also Christian churches? In an op-ed article in The Indian Express (‘Do not disagree’, 29 February 2012), Dr Pratap Bhanu Mehta while criticising the FCRA, states, ‘Of course, NGOs should be transparent and accountable in terms of their sources of funding.’ Yet, the CPR, of which Dr Mehta is president, only discloses the names of its donors in its annual report, and that too without revealing the amounts received from each. Similarly, Navdanya offers no information on either of its websites, Indian and Italian (navdanyainternational.it), on any of its funding. Other thinktanks like the PHFI and CIS offer a more detailed breakup of their different sources of funding, while some like the CSE and CCS provide only a roll of donor names and a figure of cumulative funding with no breakup of individual contributions. So, while these thinktanks are forced to disclose their foreign funding sources to the MHA under the FCRA, why do they not volunteer exhaustive information on their own websites? An amusing facet of this is that the Central Government and Corporate India are more transparent (even if forced to be) than these civil society institutions, thanks to the Right to Information Act, 2005, and the extensive disclosure requirements under the Companies Act, 1956. Of companies in particular, information is accessible over the internet on the MCA21 website of the Ministry of Corporate Affairs. This contrast is amusing because some of these thinktanks never tire of demanding transparency of the State and corporate sector. Another question is the volume of funds coming in and where it will leave India’s public institutions that were originally meant to aid policymaking with unbiased intellectual inputs. How are cash-strapped Indian universities to compete with these well-funded thinktanks? Government-run institutions of higher learning are supposed to have an inbuilt guarantee of academic independence, but would their scholarly voices be drowned out by those backed by bigger resources? Also, given the frequency with which a few foreign funders appear on donor lists, is it time to worry about their influence on Indian policies? After all, generous funding lets the faculty of these thinktanks jetset around the world to attend conferences, organise seminars in India and network with officials at a level that most public universities cannot afford. How does this impact our civil society discourse? Should Parliament limit the amount that a single foreign entity can donate, or are we better off sticking to a regulatory regime that only insists on a set of disclosure norms? On a concluding note, let us not forget that a large part of the credit for the RTI Act of 2005—the country’s most empowering piece of legislation since the Constitution of 1950—goes to the advocacy efforts of the Mazdoor Kisan Shakti Sangathan (MKSS), a farmers group in Rajasthan that does not accept institutional funding from either India or overseas. Bank interest on its corpus and donations by individuals are the MKSS’s only sources of funding. Together, the two gave it Rs 30 lakh for the financial year 2010-11, details of which are available on its website.